Beautifully restored antique Cape with great light, central heat/air conditioning and central stereo, cable TV, high-definition flat-screen entertainment, very large and beautifully landscaped yard with 2 hammocks, outdoor shower and ample parkiing! In addition, the entire house is on a state-of-the-art water filtration system. 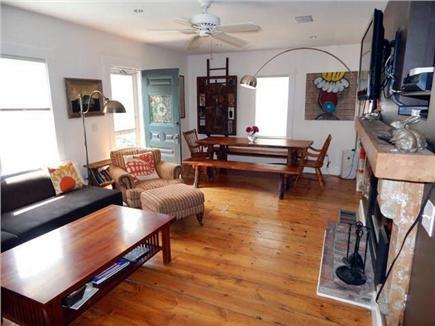 This property is located on a quiet street in the desireable ''west end'' of Provincetown. A short walk (5 minutes) to shopping, playground, dining and entertainment in one direction, and the beach or town bay in the other direction. This house is designed for relaxation with comfort in mind. Pamper yourself, you're worth it! In the summer the screened-in porch is a favorite among clients, the porch also has two cieling fans to keep the air moving on even the stillest of afternoons. This summer there is a new patio dedicated to sun-lovers and afternoon bar-b-ques. New patio furniture and more Adirondack-style seating on back porch and in the yard. Dining room table set that is perfect for entertaining and seats 8 easily. Price includes all linens and towels. The house is thoroughly cleaned each week to ensure safety and enjoyment for you and your guests. New sliding glass door from screened-in porch to living/dining area lets in tons of morning light and expands the utility of the outside entertaining space. Well-kept gardens have flowers in every season. Long-Term Rental (1 month or more): Contact owner via phone or email for long-term rental requests. Additional pricing info: Security deposit of $500.00 collected prior to occupancy. Returned promptly if no damages incur. State and local taxes of 14.45% will apply. 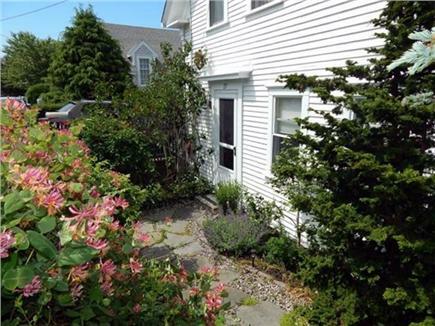 This is where you want to stay in Provincetown! The house is beautiful inside, with such care and lovely touches throughout, especially the art on the walls! The house is incredibly comfortable — good beds, great indoor and outdoor areas for living and entertaining, and a great screened porch! The yard is fenced and private. The location cannot be beat — walk to town, to the best sunsets, to bay and ocean beaches, and to Victors for the best happy hours! There is really a difference when you stay in a place that the owner has lived in and really loves. I hate to even share this review because this home is such a treasure I want it all to myself! The owner is great to work with, too. Available when we needed him, for once when we set off the smoke alarm! Always replied to my emails and calls promptly - before and after the rental. I rented Mark's place for a bachelorette weekend and the space could not have been more perfect! Mark has thought of everything you could possibly need or want to have a comfortable and relaxing get away. The yard and outside space are beautiful with lots of space to relax. The kitchen is fully stocked for cooking and has great prep space. The bedrooms are spacious and comfortable as is the living space to relax, play games, or watch T.V. Nothing not to love about this house. We have stayed at this property too many times to count over the last decade. Mark's house on Nickerson is one of our favorite places on earth, and we look forward to it every single year. The west end of Provincetown is quiet and close to the seashore and nice natural amenities like the public boat launch, which serves as our daily go-to walk at low tide. Being up a little bit from Bradford Street (rather than closer to Commercial Street) makes the block quieter still. You'll also find that the neighbors are mostly locals, rather than other transient vacationers. In short, it's the perfect location for a quiet, low-key Provincetown vacation. 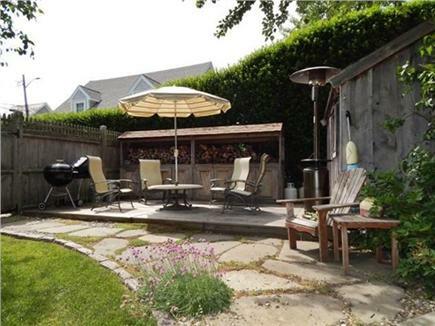 It is impossible to overstate the rarity of finding a full-sized fenced back yard in Ptown, in a rental property. It's kind of the ultimate Ptown luxury. 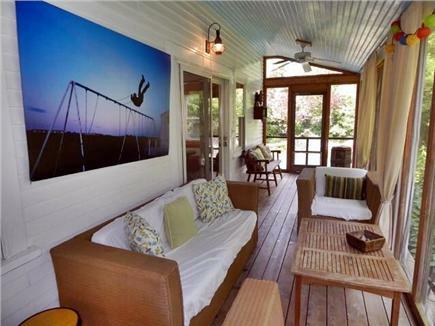 The lawn, the grill, the outdoor shower, the deck, the gardens, the screen porch -- that sort of space is unheard of, and that private outdoor (and outdoor/indoor) space is the central feature of our vacations while we're there. Inside the house, there's a great working kitchen that's not just for show -- we cook full meals basically every night when we're there. Downstairs, there's also a washer and dryer, a totally lovable shared dining/living space with a huge live-edge wooden dining table and a super comfy array of couches and chairs. There's one bedroom and one bathroom downstairs -- our Mom, who's older and doesn't do stairs anymore, has been happy year after year to take that over that downstairs bedroom as her domain. 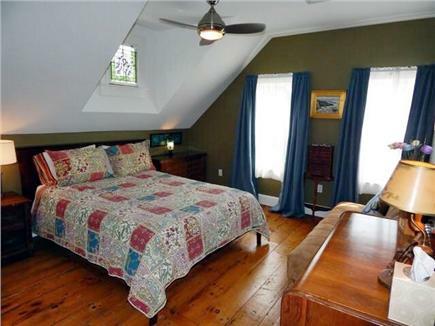 Upstairs, there's a glorious bathroom full of light with a great clawfoot tub and an oversized tiled shower, a generous foyer with a daybed in it, and the three other bedrooms. Mark has great taste in decorating, both in terms of his art (almost all local artists), and his truly rare (for Ptown) restraint in not overdoing everything and putting tchotchkes everywhere. The beds are as good as our beds at home. The cleaning and gardening folks are reliable and approachable and nice to work with. We can't recommend this property highly enough. Folks (including us) tend to book for long stretches if we can afford it, and long in advance -- so it may be tricky to find a time when you can get in. But if you can, you won't regret it. 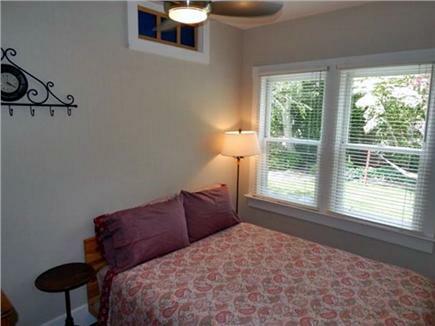 It's not like visiting a rental property, it's like staying at "your place" in Provincetown. An irreplaceable gem. I have stayed at this lovely Provincetown home for several consecutive years. The location is perfect, the house is exceptionally comfortable, and Mark is more than willing and able to accommodate any request. My friends and I always enjoy cooking in the well-appointed kitchen, and nothing beats napping in the backyard hammocks or a morning cup of coffee on the screened-in porch. All in all, this is the perfect home for a wonderful escape. We have rented places for years, and a few out of the country. This is my very first review, and I could not wait to write it. We rented this place online in the spring of this year, and the communication with Mark from the start was outstanding. He was flexible, courteous and very reachable. He made us feel comfortable and like pals. We stayed in constant contact throughout the summer, and he even called our first day in the rental and emailed to make sure everything was up to par. The pictures on this page do not do this place justice (and they are great pictures!) The parking was ample, which is a big deal here and hard to come by. The location was right next to everything! We walked every day and never took our vehicles out (we had two rental vehicles with us). We walked to Commercial Street to shop, to eat, around the neighborhood and even to the Quik Shop Grocery Store! I had my elderly parents with us, and my mother is disabled but stayed here with ease. There is a downstairs bedroom and bath/shower that requires no stairs. I also had my six year old daughter, and a few others in our parties in their 30's-40's, with a total of 9! My husband and I slept with our young daughter in our bed, but there is actually room for more! There are couches that are just as comfortable and could sleep more if need be, and one of our guests who enjoyed the weather so much actually slept on the porch one night. This house is loved, and you can feel it as soon as you walk in the door. There is local artwork all around the house (Mark buys one piece a year for the house). The kitchen was stocked better than my own home, with spices, olive oil, utensils and pots and pans! Even fresh butter! 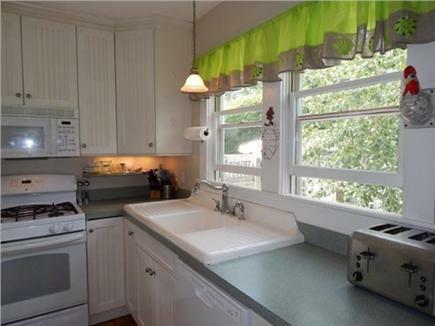 The kitchen has a great gas stove, and is so cute. Even has the large ranch style sink that fits perfect with the style, and stained glass in many windows so the sun shines in through colors! The cabinets are all newer. The washer and dryer are the top of its line (as you will see with everything in this house, from the iron to the toaster!) 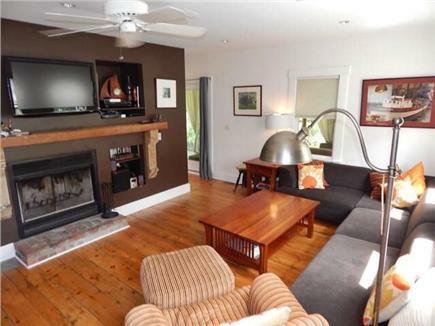 The living room has a working fireplace, with a wonderful couch that seats many. We never once felt crowded, you have so many places to sit and chat, or read or have drink! The porch was our favorite for coffee in the morning, the picture shows one couch but it now has two matching chairs, and tons of comfy pillows and blankets if you get a chill. The aroma coming from the yard just permeates your soul out here. 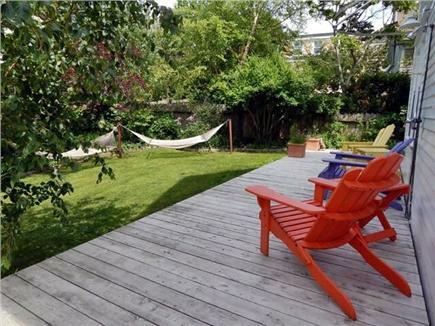 From here you can move to the back yard where you can sit on the back porch with the Adirondack chairs, or into the yard with the two hammocks! (We spent so much time in these!) Or the table and chairs off to the side to eat. See, we never once felt crowded! 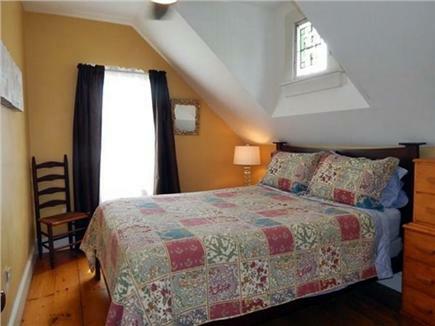 The rooms upstairs are smaller, but perfect! You can fit your suitcases easily in them and plenty of closet and drawer space in each room to unpack. There is a fold out bed in one of these rooms, and a little room in between all three bedrooms with a wonderful couch for sitting. The bathroom upstairs has an antique tub that is priceless. A great walk in shower, and so much light from the windows you never need artificial light. The bathroom had everything from itch cream for bug bites, to band aids. Each piece of antique furniture fits with each other, you feel as if you are stepping back in time, with infinite (nice!!) hot water for showers (we all took a shower back to back and never ran out!) and a very nice coffee maker! The linens and towels were too many to count! There was wood, beach supplies, lawn chairs....just copious amount of things that you may not think to travel with. Great week on the cape!